click Crack KABAM. That’s going to hurt. Poor Jacqueline. I’m heading back home after a weekend at Disney with the family. For a load of pictures and running commentary, check out my twitter feed! Warning, there will be lots of cuteness. Please vote for Snow by Night to see a preview of the next page! As always, thank you to our Patreon backers! Hotwings uses Epic Burn. It’s super effective! 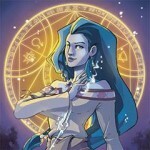 Oooh, new default userpic! It’s pretty. 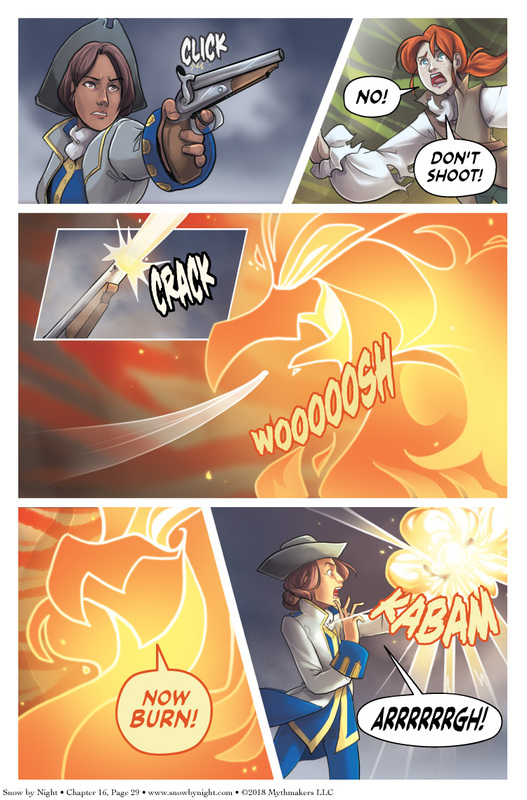 I love this comic including all of the artwork and layout, but I have just one nitpicky suggestion: might the last panel look a bit better with the sound effect moved below the exploding gun and the speech balloon pointed up to her face? It just looks slightly off compared to everything else I’ve seen here. Please disregard if you disagree. Wonderful work all around! So funny thing. When Julie drew the page, I forgot to mention to her that the pistol was in Jacqueline’s left hand. She drew it in her right. K. Lynn has already done the vignette which had the left hand injured. So we had to switch hands. I forgot to adjust the lettering on this panel. WHOOPS! Anyway, it’s tidied up now. Thank you for bringing that to my attention. I love this comic, and I just want to say that I’m super excited that K. Lynn is contributing, because I love her work, too! Thanks for the heads-up! K. Lynn is amazing, both as an artist and a person. I loved hanging out with her at ECCC. She takes over after page 32 of this chapter. Pretty clearly a percussion cap pistol. Which is surprising, since everything else looks a lot earlier. (Ie; everything else looks like the flintlock era.) I’ll admit that I haven’t read all the Almanac stuff. Maybe this was covered elsewhere? It’s intended to be a flintlock pistol. Small technical error. Once the powder was used for the shot, there is nothing left in the flint lock for Talons-that-Seek to make explode. He would have targeted her black powder pouch, most likely attached to her belt. Talons is a magical creature and wasn’t using the powder left in the flintlock. Instead, when Jacqui fired her pistol, she created an arcane connection between her pistol and the manitou. Talons used that connection to cause the pistol to explode using his own fire rather than left over gunpowder. If Talons wasn’t a magical thing, I’d agree with you. Her cartridge box that she’d carry on her belt would be what would explode. More medicine. I hope it’s magic medicine. With the emphasis on magic.